Located just a short walk from home in Hampden Road Nedlands WA, this has recently been renovated and was previously known as Six Clicks. A good size water bowl always available and the girls really like me there. Excellent coffee and great for breakfast and lunch and soon to be open for dinner in a wine bar bistro style. These photos are the day that Stormie Mills did a painting on the wall which was one of the cafes finishing touches. An Italian restaurant at the north end of Rokeby Road in Subiaco WA, serving excellent pizzas and other italian fare. They made me welcome and even brough me water before mum and dad and without even asking. It is hard to find places to go to at night but this was good. As it is near the train station there was lots of traffic so had lots of people stop for a pat. It is a full-time job getting cuddled, patted and rubbed. 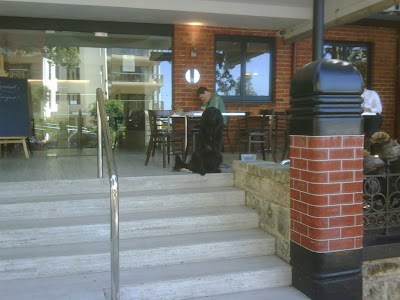 Located on Cottesloe Beach adjacent the Ocean Beach Hotel, OBH to the locals, Barchetta is a very dog friendly place. Water is always available. My Saturday walk is from my mate Errol’s house in Swanbourne, where we get to walk the sandhills south of Swanbourne Barracks and down onto the Cottesloe dog beach which is a great spot throughout the year. Good coffee and a good breakfast and lots of friends around. Bouchard’s is one of our favourite spots particularly for breakfast. Acknowledged as one of Perth’s best restaurants, it provides breakfasts, lunch and dinner. As a breakfast place, after a long walk from our home through Kings Park, there is always water readily available and a cuddle so you can’t better. The food and coffee, in particular their Spanish Omlette (so I am told) is also excellent. I also get the benefit of the guests coming and going from the hotel so there are plenty of pats. Even the postman knows me we are there so often. While we occasionally come for lunch and dinner, I only go when I know when it isn’t going to be busy which means I haven’t been going lately as it is a very popular spot. Located at the city end of Mount Street just over the bridge from the city. Lovely views and the occasional dog to catch up with. 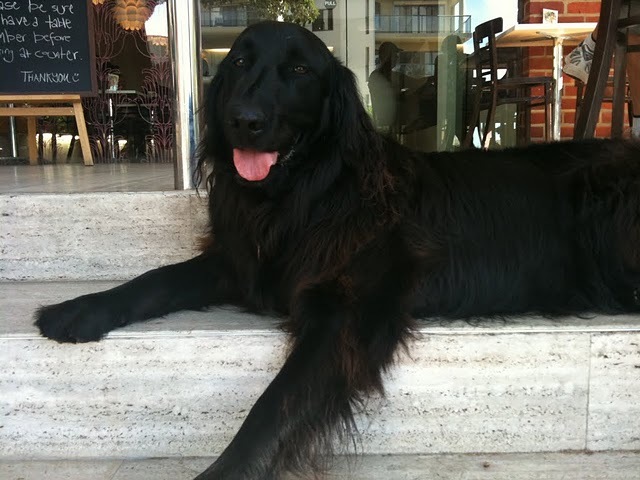 Bruno, the building owners dog and I get a bit territorial from time to time but I have the upper hand as the older dog. 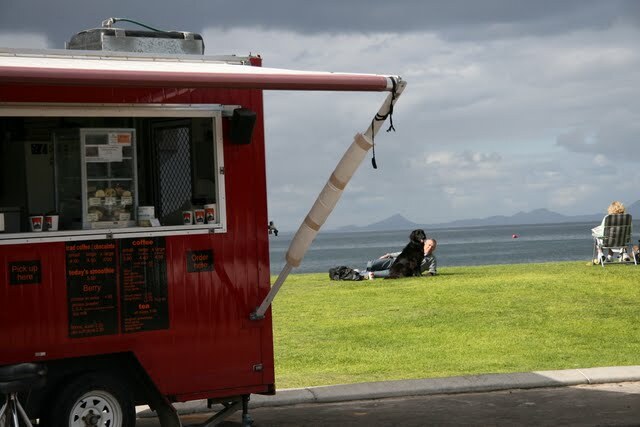 A coffee cart on the foreshore at Tayler Jetty in Esperance serving a really good coffee, smoothies and some light food. Great spot as you can just enjoy the lawns between the car park and the dog beach.